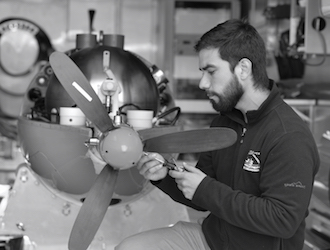 Field engineer in Arctic scientific missions, both in oceanographic campaigns and sea-ice expeditions. Pilot of autonomous underwater platforms such as Lagrangian BGC-Argo floats and propeller-driven AUVs. Designer and builder, interested in: Broadband communications in harsh environments, low-energy auto-organized networks, underwater geo-localization, sea-ice detection and scientific instrumentation for autonomous underwater platforms. J. Lagunas and S. Roy, "Chaos-Based Modulation for Blind and Coherent Signal Detection in Non-Cooperative TDD Cellular Networks with Large Antenna Arrays". 2014 International Conference on Computing, Networking and Communications (ICNC 2014). J. Lagunas and S. Roy, "Channel Estimation Using Time-Shifted Pilot Sequences in Non-Cooperative Cellular TDD Networks with Large Antenna Arrays". 47th Asilomar Conference on Signals, Systems and Computers, 2013. J. Lagunas et S. Roy, "Training Sequence Design for Robust Joint Detection and Channel Estimation Over Rank-Deficient MIMO Links," International Conference on Computing, Networking and Communications (ICNC), Maui, Hawaii, 30 janv.-2 fév. 2012. J. Lagunas and S. Roy, "On Joint Detection and Channel Estimation over Virtual MIMO Links with Sphere Decoding", IEEE 2011 Canadian Workshop on Information Theory (CWIT), 2011. J. Lagunas and S. Roy, "Spectrally Efficient and Low-Complexity Maximum-Likelihood Detection for Chaotic MIMO Systems", IEEE Workshop on Signal Processing Systems, 2010. J. Lagunas and S. Roy, "Robust Joint Channel Estimation and Symbol Detection", IASTED International Conference on Wireless Communications, 2010. J. Lagunas and S. Roy, "Chaotic MIMO - Spatial Diversity Techniques for DCSK Modulation", IASTED International Conference on Wireless Communications, 2010. J. Lagunas and S. Roy, "A low complex sphere decoder with noise-predictive radius initialization", IASTED International Conference on Wireless Communications, 2010. J. Lagunas, "Signal detection and channel estimation over rank deficient MIMO channels", Université Laval, doctorate thesis, 2012. J. Lagunas, "Analysis and selection of middleware solutions for a Wireless Sensor Network oriented to monitor on-duty Firefighters", Telecom Italia Lab, 2006. J. Lagunas, "Doubling the number radio stations on the FM licensed band in Mexico city via CDMA", ITESM-CCM (Undergraduate Thesis), 2003.